n=2. Dipole moment 2.4D. Note how the O…H bond becomes shorter. n=3. Dipole moment 2.5D. Note how the key O..H bond is contracting rapidly, as are the other H-bond interactions. This is the cyclic polarisation effect, where each bond influences the others. 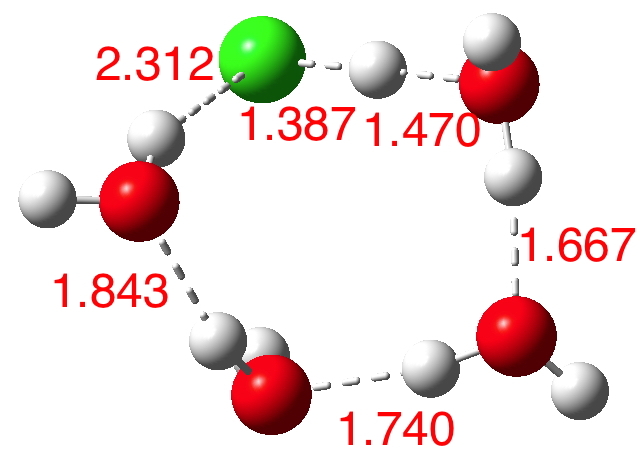 We are starting to approach the formation of H3O+ and Cl–! n=4. 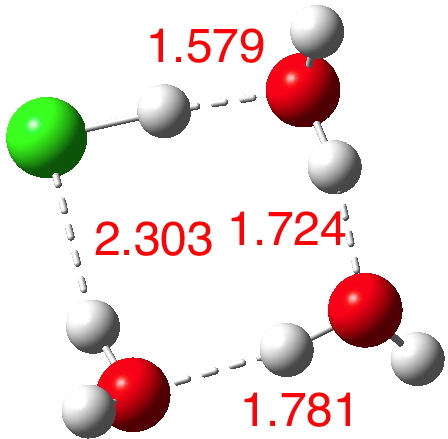 Dipole moment 2.3 D, We have two ways to add the next water molecule, firstly to try to stabilise the H3O+. Nope. 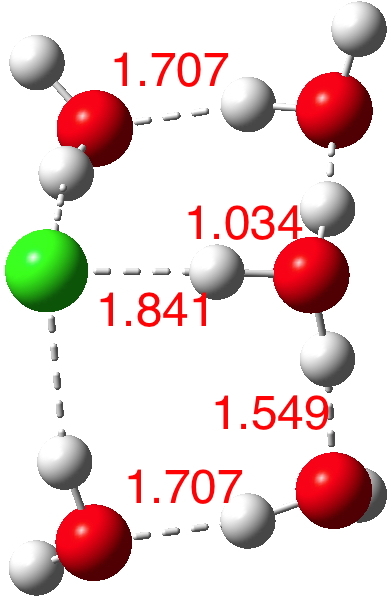 n=4, Dipole moment 1.1 D. Better by solvating the Cl–! 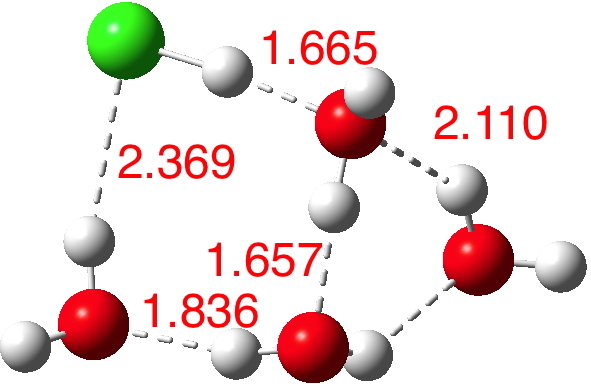 The proton originally attached to the Cl is now starting its transfer to the water to form that hydronium cation, but the dipole moment is not yet large. n=5. Dipole moment 4.7D. The ionisation is almost complete and the dipole moment is on the increase. n=6. 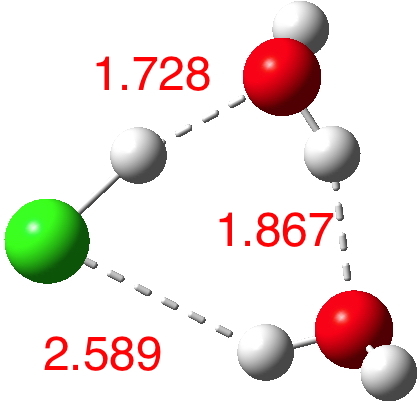 The dipole moment is up to 8.2D and the three H-O bonds of the hydronium cation are almost all equal in length. A cautionary observation though. 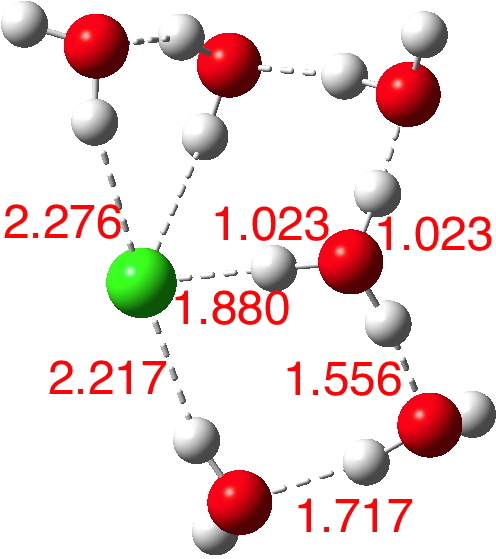 The isomer below for n=6 is lower in energy by ΔG -1.2 kcal/mol, and its dipole moment is only 2.5D! 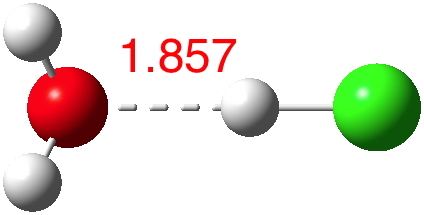 The charges (summed onto heavy atoms) show the chloride to have -0.88 and the hydronium cation +0.88, so it is a true ion-pair, despite its dipole moment. 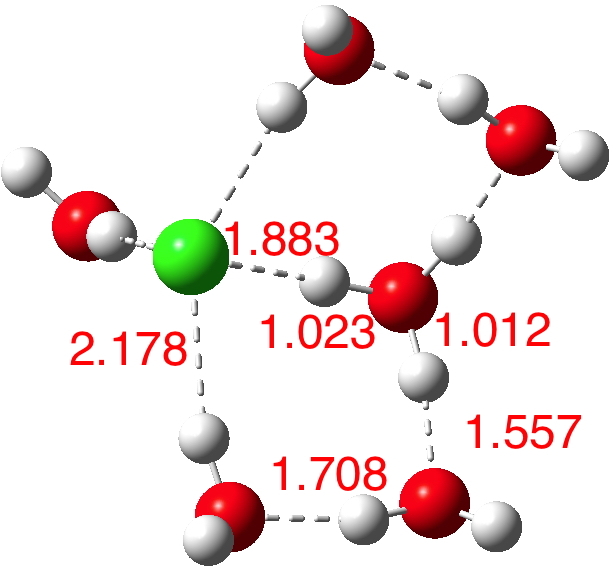 So these calculations do indeed appear to confirm that 5-6 water molecules are required to ionise HCl. But it does raise the interesting issue that even for n=6, there are poses for the assembly which have low dipole moments. Clearly of course the observed dipole moment is a dynamic average over many conformations of similar energy but the prediction that some of these may have low dipole moments should be noted. ‡ If you right-click in the 3D model area, you can bring down a list of vibrational modes for each complex from the first item of the pop-up menu that appears (labelled model). You might wish to e.g. explore how the H-Cl stretch vibration changes as the ionisation increases. This entry was posted on Saturday, February 14th, 2015 at 4:26 pm and is filed under Interesting chemistry, reaction mechanism. You can follow any responses to this entry through the RSS 2.0 feed. You can leave a response, or trackback from your own site.